The classification of clinical problems, such as AIDS, requires choices. Choices are made on epistemic (i.e., knowledge-based) and non-epistemic (i.e., action-based) grounds. That is, the ways in which we classify clinical problems, such as AIDS, involve a balancing of different understandings of clinical reality and of clinical values among participants of the clinical community. 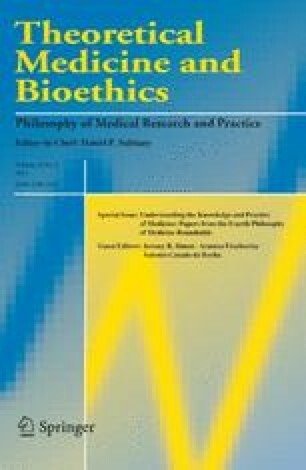 On this view, the interplay between epistemic and non-epistemic interests occurs within the embrace of particular clinical contexts. The ways in which we classify AIDS is the topic of this paper. We consider the extent to which we construct clinical reality; we examine a suggested classification of AIDS; and we conclude suggesting that the choice regarding how to classify AIDS is the result of negotiation among participants in the clinical community.